Yes, Google has answers for just about anything. But when it comes to serious research, students can’t cite Google as a reliable source. Amy Lewandowski, the media center director and technology coach at James Hart School in Homewood, wanted to improve student learning but she’d investigated the cost to keep databases current and found it was just too expensive. It was during a meeting with a representative from Reaching Across Illinois Library System (RAILS) that Lewandowski learned a school in Indiana had linked to the Lake County Library for research. She approached Amy Crump, Homewood library’s director, to see if Homewood could duplicate those services for her students. “It sounded like a great idea because we certainly have these resources that we want people to be using,” Crump said. Karin Gerson, head of patron services at the Homewood library, contacted the System Wide Automated Network (SWAN) that links the collections of 97 libraries into a single, searchable public web catalog of nearly 10 million items. SWAN approval was necessary because the network manages Homewood’s library cards and databases access. “We had to make sure it could work” between a school and the network, Crump explained. Gerson planned the pilot program between the Hart and Homewood libraries with Lewandowski, Hart Principal Scott McAlister and District 153 Superintendent Dale Mitchell. Once all the pieces were in place, Homewood Librarian Kelly Campos met teachers, offering insights on how the digital access would work. 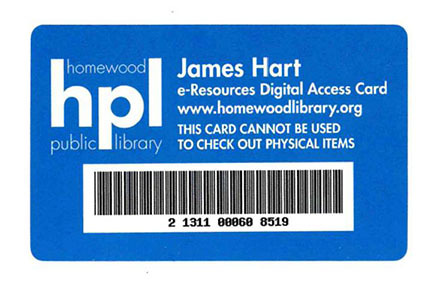 Homewood patrons use their library cards to access databases. For this project, SWAN designed special cards for student access. Each student gets a card during English/Language Arts class. Students enter the card’s code number to enter the Homewood library system. Lewandowski started with the 180 sixth graders at Hart who are doing research on the civil rights movement. About 60 students at a time spend 82 minutes per class doing research. They use the SWAN cards and return them at the end of the class. The cards are then shared with the next group. The class is reading the book “The Watsons Go To Birmingham – 1963” and sixth grader Rachel Brooks was doing research on the Little Rock Nine, the group of students who in 1957 were the first to integrate all-white Little Rock Central High School. Sixth grader Sawyer Fogarty was researching the Civil Right Act of 1964. Both students said they rely on Google, but because of the new SWAN link, they have many more options. “They know that it’s true. (Now) they’re not worried about a site on Google giving accurate information” and the students are learning the research process, she said. The next group to use the databases will be eighth graders who will do research for their mock Congressional hearings. Campos anticipates the program expanding next year to Churchill School where students do research projects for Black History Month. “There are a lot of people who’ve done amazing things. We just don’t have a book about them,” Campos said. Using SWAN, students will find articles about outstanding people that they didn’t have access to before. All the new databases, “are really going to come in handy,” she added.